Alexander McNab left his native Scotland in the late 19th Century to homestead a 10,000 acre sheep ranch located in the Sanel Rancho, which later became Hopland, California. 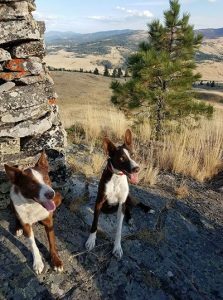 Looking to develop a herding dog that could handle the rough conditions on his ranch, Alexander crossed the Scottish Collies he brought with him with the tough dogs of the nomadic Basque sheepherders he met near his ranch. John McNab, Alexander’s son, later became sole owner of the McNab Ranch. He made several importations in the early 1900s from the Grampian Hills of Scotland, including a a red dog called Ready. Ready is often cited as the reason that there is occasionally red pups in a litter. Over time, the McNab Shepherds proved to be supreme herding dogs which California ranchers came to depend on with confidence. 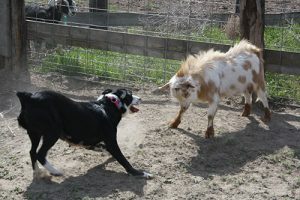 Now the breed is spreading across the United States and Canada with a few McNabs working as stock dogs in Germany and some sporting McNabs as far away as Japan. There were periods in Northern California, such as during the 1950s, where virtually every large ranch had McNabs Shepherds. The McNab Shepherd is bred for its working ability and is not recognized by the American Kennel Club (AKC). For this reason, the appearance of the McNab can vary considerably. The dog is medium sized with females standing 16-21 inches at the shoulder and weighing 30-50 pounds and males standing 18-25 inches at the shoulder and weighing 35-65 pounds. The dogs have a variety of ear sets from pricked ears to floppy ears and everything in between. Most McNabs are black or brown with white feet, white collars, white facial strips and white tipped tails, but tricolor McNabs are well known as well as mostly black McNabs. Some McNabs sport random white patches on their bodies and faces. Their eyes are set well apart, almond shaped, and brown, hazel, or copper colored with occasional marble flecked or powder blue eyes. The McNab coat is close, dense and weather resistant. 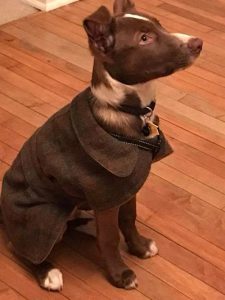 They can have a slick single short coat, a short double coat, or a medium length single coat, but their fur is never long. McNab Shepherds have a loose-eyed herding style and tend to work more independently than many herding breeds. They are skilled at both heading and heeling stock, meaning they can turn stock from the front or get behind stock and drive them forward. Originally bred to herd sheep, stock handlers quickly discovered that the McNabs bold nature and working abilities made them ideal for herding cattle. McNabs are also used for herding geese, goats, llamas and gathering horses in from the pasture. Renowned for their incredible endurance, McNabs have been known to cover over a hundred miles a day driving their herds. McNabs often bond tightly to their family members, including other household pets. They have a keen sense of territory and seldom wander away from home. They are also more likely to defend their territory and family members than many of the more sensitive herding breeds. McNab Shepherds can be assertive and demanding, and they do best with guardians who are firm, consistent and skilled in positive dog training methods that don’t trigger the McNabs instinct to push back against obstacles. Highly intelligent and quick to learn, the McNab needs mental stimulation as much as physical exercise. Families considering a McNab for a pet will need to set aside plenty of time to spend with their dog. McNab Shepherds are hardy dogs with no breed specific health problems. Their average life span is 13–15 years. 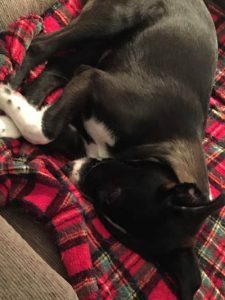 However, it must be noted that McNab dogs may carry the MDR1 mutant gene and can be very sensitive to Ivermectin, which is a common ingredient in heartworm prevention medications. This drug and others drugs can cause serious health problems and even death. McNab Shepherds are becoming increasingly popular in the world of dog sports. Their outstanding athletic prowess and agility coupled with high intelligence make them ideal competitors. 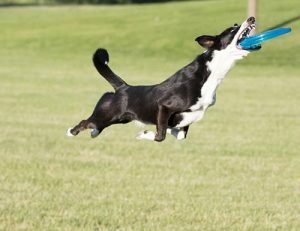 McNabs are now competing successfully in agility trials, dock diving, disc dog competitions, and flyball. McNabs are also exceptional competitors in barn hunt and nose work. Many ranchers are competing with McNabs in the relatively new sport of Ranch Dog Herding where dog and handler on horseback work as a team herding three head of cattle through five obstacles and then into a stock trailer. The McNab Shepherd’s reputation as an indefatigable “all-weather” dog is also opening up a new avenue of work for the dog: Search and Rescue. Currently McNabs are working as evidence search dogs, cadaver dogs, archaeology dogs, and area search dogs for missing persons. Where many other breeds have to be pulled off the search because the dog is tiring, the only limitation for the McNab is the energy of its handler. In addition to the above activities, McNabs are now becoming more common as service dogs, demonstrating sensitivity to the medical and psychological needs of humans. Gus, a Rockin’ KR McNabs dog, moving cattle.